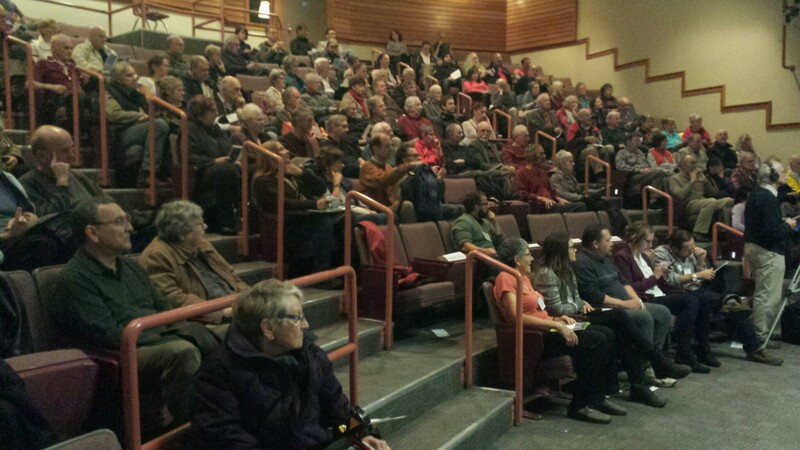 Audience at the November 3 Community Forum in the Stan Hagen Theater of North Island college (Photo credit: Pieter Vorster). Cory Frank of the K’ómoks First Nation welcoming audience to the traditional territory of the K’ómoks people (Photo Credit: Pieter Voster). The forum was divided into two parts. There were three short presentations. 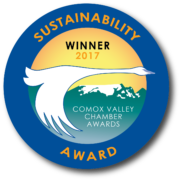 Jennifer Sutherst, Staff Biologist & Estuary Coordinator presented Project Watershed’s vision for a restored shoreline with channelization and the upper part developed into walking and cycling trails. Tim Ennis, Project Watershed Director at Large discussed and compared the mill restorations in Campbell River with the proposed Field re-envisioning plans. Darcy Miller, Fisheries & Oceans Canada, Puntledge Hatchery Manager, talked about salmon predation by seals and the role of the steel clad wall in facilitating trapping of fish by the seals. 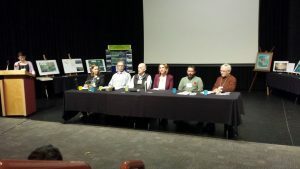 The Community Forum Panel from left to right (Jennifer Sutherst, Dan Bowen, Bill Heath, Rebecca Lennox, Darcy Miller, Don Castleden) (Photo Credit: Pieter Vorster). Sandra Borton from the Comox Valley Conservation Strategy facilitated a panel discussion with six panel members (see photo 3). These panel members answered questions and had exchanges with the audience for approximately 45 minutes. Key topics included obtaining a revaluation of the value of the Interfor property, who is responsible for waste clean ups, the role of local and federal government, fundraising and other Germaine topical areas. 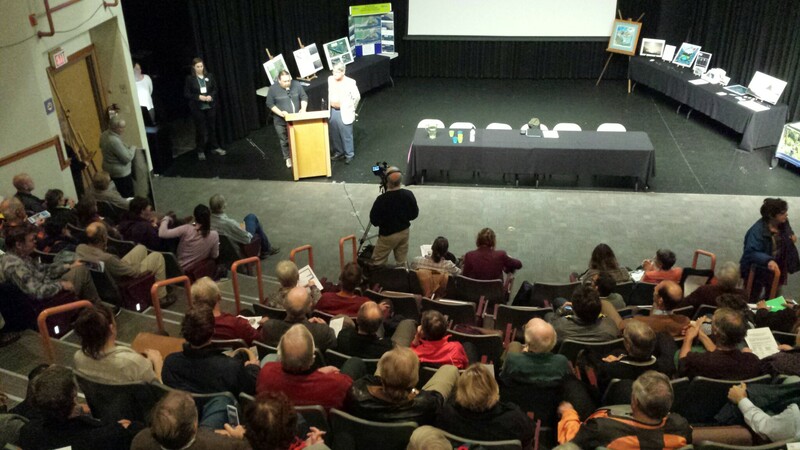 “The success of the event surely implies the broad community support for Project Watershed’s plans.” commented Councillor Rebecca Lennox and one of the evening’s panel members. The petition for supporting this project is available below, on the front page of the Project Watershed website and in the office located at 2356a Rosewall Crescent in Tin Town (office hours 830am-12-30pm). 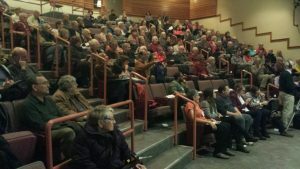 The petition has already gained over 100 signatures with more coming in—this letter will be sent to the Nature Conservancy of Canada to increase the priority of this project’s ranking. 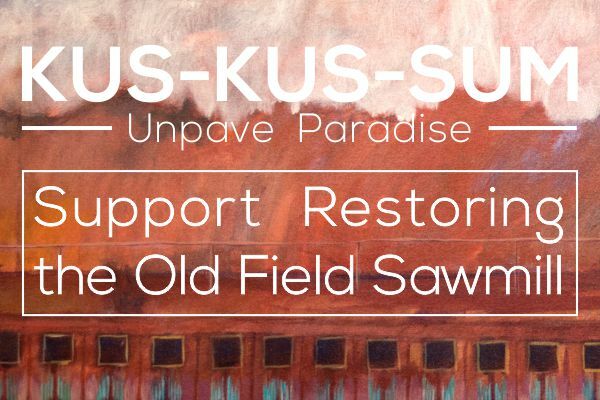 To achieve the goal of acquiring the Field Sawmill Site for purpose of restoration and long-term conservation, we the undersigned request that the Nature Conservancy of Canada make the securement of the Field Sawmill Site a priority, knowing that Project Watershed, the City of Courtenay, K’ómoks First Nation, Comox Valley Regional District, Fisheries and Oceans Canada and a number of local environmental organizations in the Comox Valley together with the community will work to assist in this goal.